Line a rimmed baking sheet with parchment or wax paper. Place the chocolate chips in a heavy 1-quart pot over low heat. Stir continuously until the chocolate chips have melted. Place the melted chocolate chips and the rest of the ingredients in a bowl and mix to combine. Using a large spoon, scoop up some of the mixture and place it on the lined baking sheet. Use your fingers to form it into a round shape. Repeat with the rest of the mixture until you have 20 round clusters. Lightly sprinkle salt on each cluster. 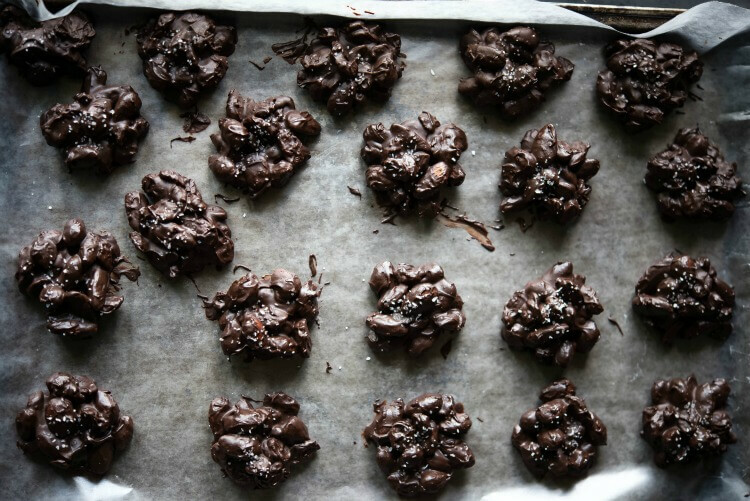 Put baking sheet in freezer until clusters are firm, about 30 minutes. Store the clusters in the fridge for up to 2 weeks.